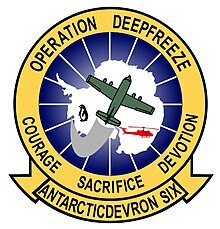 Operation Deep Freeze (OpDFrz or ODF) is codename for a series of United States missions to Antarctica, beginning with "Operation Deep Freeze I" in 1955–56, followed by "Operation Deep Freeze II", "Operation Deep Freeze III", and so on. 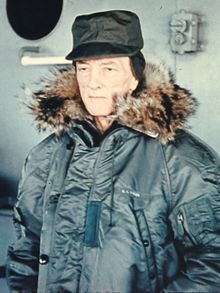 (There was an initial operation before Admiral Byrd proposed 'Deep Freeze'). Given the continuing and constant US presence in Antarctica since that date, "Operation Deep Freeze" has come to be used as a general term for US operations in that continent, and in particular for the regular missions to resupply US Antarctic bases, coordinated by the United States military. Squadron patch for the Navy Antarctic Development Squadron SIX (VXE-6), known as the Puckered Penguins. The U.S. Navy already had a record of earlier exploration in Antarctica. As early as 1839, Captain Charles Wilkes led the first U.S. Naval expedition into Antarctic waters. In 1929, Admiral Richard E. Byrd established a naval base at Little America I, led an expedition to explore further inland, and conducted the first flight over the South Pole. From 1934–35, the second Byrd Expedition explored much further inland and also "wintered over". The third Byrd Expedition in 1940 charted the Ross Sea. 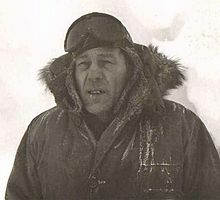 Byrd was instrumental in the Navy's Operation Highjump after World War II from 1946–47, which charted most of the Antarctic coastline. In 1948, Commander Finn Ronne led an expedition that photographed over 450,000 square miles (1.1 million km²) by air. Then in 1954–55, the icebreaker USS Atka (AGB-3) made a scouting expedition for future landing sites and bays. In 1955, Task Force 43 was formed to carry out this work. Operation Deep Freeze I prepared a permanent research station and paved the way for more exhaustive research in later Deep Freeze operations. The expedition transpired over the Antarctic summer of November 1955 to April 1956, and was filmed by the U.S. Navy and Walt Disney Studios. For having designed the emblem of Task Force 43, Walt Disney became an honorary member of the expedition. On 31 October 1956, US Navy Rear Admiral George J. Dufek and others successfully landed an R4D Skytrain (Douglas DC-3) aircraft at the South Pole, as part of the expeditions mounted for the IGY. This was the first aircraft to land at the South Pole and the first time that Americans had set foot on the South Pole. The aircraft was named Que Sera, Sera after a popular song and is now on display at the Naval Aviation Museum in Pensacola, Florida. This marked the beginning of the establishment of the first permanent base, by airlift, at the South Pole (today known as the Amundsen–Scott South Pole Station) to support the International Geophysical Year. It was commissioned on January 1, 1957. The original station ("Old Byrd") lasted about four years before it began to collapse under the snow. Construction of a second underground station in a nearby location began in 1960, and it was used until 1972. The station was then converted into a summer-only field camp until it was abandoned in 2004-05. The mission's 2nd base, The Byrd Station a (former) research station established by the United States during the International Geophysical Year by the U.S. Navy during Operation Deep Freeze II in West Antarctica. The United States Antarctic Program airfield, built to service Operation Deep Freeze (first mission) was later named Williams Field or Willy Field. Helmut P. Jaron, Aurora Researcher at Byrd Station in 1961. The Jaron Cliffs are named for him. The Operation Deep Freeze activities were succeeded by "Operation Deep Freeze II", and so on, continuing a constant US presence in Antarctica since that date. The Coast Guard participated, USCGC Northwind supported the mission throughout the 1970s, 1971-72, 1972-73, 1976-77, 1979-80. The Navy's Antarctic Development Squadron Six had been flying scientific and military missions to Greenland and the arctic compound's Williams Field since 1975. The 109th operated ski-equipped LC-130s had been flying National Science Foundation support missions to Antarctica since 1988. In early 1996, the United States National Guard announced that the 109th Airlift Wing at Schenectady County Airport in Scotia, New York was slated to assume that entire mission from the United States Navy in 1999. The Antarctic operation would be fully funded by the National Science Foundation. The 109th expected to add approximately 235 full-time personnel to support that operation. The possibility of the Air National Guard assuming operational control of the mission had first emerged in 1988. The 109th Airlift Wing had been notified that, almost overnight, one of the Distant Early Warning Line (DEW) radar sites that it supported in Greenland was going to be shut down. The other sites would soon follow, and the 109th would be largely out of business because its primary mission had ended. The unit had been informally keeping tabs on Navy LC-130 operations supporting the National Science Foundation in Antarctica. Because of its aging aircraft fleet and extensive depot maintenance period, the United States Navy asked if the 109th could provide limited emergency search and rescue (SAR) capability for two years to support Operation Deep Freeze, which the Air Guard accepted. At that time, it had no thought of taking over the mission. The 109th believed it to be an exercise in futility for its aircraft to deploy to the Antarctic to merely wait for emergency SAR missions, so it asked if the Navy could help carry cargo to the South Pole. The Navy resisted at first because its procedures and cargo configurations differed from those of the Air Guard, but eventually it agreed. The main mission of the U.S. Navy and Air National Guard C-130s was to airlift fuel and supplies to the National Science Foundation's South Pole Station so that its personnel could survive the isolation of the long Antarctic winter, which lasted from February to October. An Air National Guard working group had been formed to study the idea in 1990. The following year, a dialog began among the Air National Guard, the Air Staff, and the United States Navy. Among other issues, it was difficult at first for the Air Guard to convince the Air Staff to commit long term resources to an area of the world that had not been declared a warfighting region because of international treaties. The Air Guard had supported military operations in Greenland and the Arctic (including classified U.S. Navy operations) since the mid-1970s with the ski-equipped C-130s of the 109th Airlift Wing. It convinced Headquarters, United States Air Force that it was not in the nation's best interest to abandon the capability to achieve quick and reliable air access to both polar regions. In March 1993, the U.S. Navy hosted a two-day workshop with representatives of the National Science Foundation, Air National Guard, and other interested parties to explore logistics support options for the operation. A draft concept of operations had been prepared by the Air Directorate of the National Guard Bureau in 1993. In February 1996, a commitment was made to transfer the Operation Deep Freeze mission and all LC-130H aircraft operating within the U.S. Department of Defense to the Air National Guard. In September 1996, senior officers from the 109th Airlift Wing briefed the National Guard Bureau on their concept of operations and the status of their preparations to implement Operation Deep Freeze. A US Air Force C-141 Starlifter participating in Operation Deep Freeze. Under the transition plan which they had developed, the Air National Guard would continue to augment the United States Navy during the October 1996 – March 1997 operating season for the United States Antarctic Program. At the end of the October 1997 – March 1998 season, the Air National Guard would assume command of the program. During the third year of the transition program (October 1998 to March 1999), the U.S. Navy would augment the ANG before the latter took over the entire program the following year. There would be seven LC-130s in theater. They would stage from Christchurch International Airport in Christchurch, New Zealand to McMurdo Station, Antarctica. Traditional Guardsmen, technicians, and the cadre of Active Guard Reservists specifically brought on board to support Operation Deep Freeze would all be involved in the mission. When fully transitioned to the Air National Guard, the 109th Airlift Wing would have ten LC-130s in its inventory. These would include upgrades of four LC-130 aircraft in-service with the unit plus three new aircraft and three that would be transferred from the U.S. Navy. Air National Guard estimates of the savings to be realized by consolidating the operation in the hands of the 109th Airlift Wing ranged from US $5 million to US $15 million a year. The actual transition to Air Guard control began in March 1996. By 1999, the United States Navy had transferred military support operations for Antarctica over to the United States Air Force and its contractor Raytheon Polar Services. Operation Deep Freeze was managed by the U.S. Air Force and Air National Guard members of Air National Guard Detachment 13, a subordinate unit which administratively reported directly to the Air National Guard Readiness Center (ANGRC) at Andrews Air Force Base in Maryland, and operationally reported to United States Pacific Command (USPACOM) in Honolulu, Hawaii. Upon its deactivation in 2005, the detachment consisted of a full-time officer (Commander) and four full-time non-commissioned officers (Logistics, Communications, Security Forces, and Information Management) which remained in New Zealand year-round. Operational command now belongs to Commander, Thirteenth Air Force as part of USPACOM. 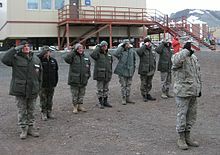 In 2005, through the office of the Secretary of Defense, the commander of U.S. Pacific Command was designated to support the Joint Task Force Support Forces Antarctica, Operation Deep Freeze. CDRUSPACOM delegated this joint operation to the Commander, Pacific Air Forces, who then delegated primary responsibility for execution of the JTF SFA operation to the Commander, 13th Air Force. United States civilian and scientific operations on the Antarctic continent are overseen by the United States Antarctic Program as well as the National Science Foundation. Military support missions flown from Christchurch International Airport are conducted during the Antarctic summer (late September to early March) each year by The 109th Airlift Wing Scotia New York. The Ski equipped LC-130 Hercules is the backbone of Operation Deep Freeze. Without the capability of the 139th Air Lift Squadron many of the research projects would cease. LC-130 Hercules aircraft provide the logistical movement of cargo to remote operating locations on the continent. These aircraft are augmented by the United States Coast Guard icebreaker USCGC Polar Star, the Air Force Materiel Command, and the Military Sealift Command. The United States Air Force 13th Air Expeditionary Group deploys to Christchurch, New Zealand during the operational season. A documentary on the early missions, "Ice Eagles: An Account of American Aviation in Antarctica," was scheduled to be released in 2016. Lockheed Martin is currently the prime contractor for the National Science Foundation’s United States Antarctic Program. The contract award was announced via a NSF press release on 28 December 2011 after a bid solicitation process of almost four years. Support operations began on 1 April 2012. The original contract synopsis indicated that the government was contemplating a contract period of ​11 1⁄2 years. ^ "February 1, 1955: Task Force 43 Commissioned to Plan and Execute Operation Deepfreeze". Naval History Blog. Disney, Walt (host) (12 Sep 1956). "Antarctica: Past and Present". Disneyland. Season 3. Episode 1 . ABC. Disney, Walt (host) (5 Jun 1957). "Antarctica: Operation Deepfreeze". Disneyland. Season 3. Episode 26 . ABC. Disney, Walt (host) (13 Nov 1957). "To the South Pole for Science". Disneyland. Season 4. Episode 9 . ABC. ^ United States Antarctic Projects Officer (Jan 1961). "Operation Deep Freeze Plaque" (PDF). Bulletin of the U.S. Antarctic Projects Officer. Washington, DC: USAPO. 2 (5): 28. ISSN 0503-5392. ^ "Dates in U.S. Naval History". ^ "The Antarctic Sun: News about Antarctica - Byrd History (page 1)". antarcticsun.usap.gov. Retrieved 26 March 2018. ^ "OAE's Williams Field Antarctica". www.coolantarctica.com. Retrieved 26 March 2018. ^ "Wayback Machine" (PDF). 30 September 2007. Archived from the original (PDF) on 30 September 2007. Retrieved 26 March 2018. ^ Mary Stortstrom (March 15, 2015). "Veteran recalls details of his mission to Antarctica". The Journal. Retrieved March 15, 2015. ^ "Antarctic Support Contract". lockheedmartin.com. Archived from the original on 2014-06-26. ^ "NSF Awards Logistical Support Contract for U.S. Antarctic Program - NSF - National Science Foundation". nsf.gov. Wikimedia Commons has media related to Operation Deep Freeze. The Churchill Mountains are a mountain range group of the Transantarctic Mountains System, located in the Ross Dependency region of Antarctica. They border on the western side of the Ross Ice Shelf, between Byrd Glacier and Nimrod Glacier. The 109th Airlift Wing is a unit of the New York Air National Guard, stationed at Stratton Air National Guard Base, Schenectady, New York. If activated to federal service, the Wing is gained by the United States Air Force Air Mobility Command. Sewart Air Force Base (1941–1971) is a former United States Air Force base located in Smyrna, about 25 miles southeast of Nashville, Tennessee. During World War II, it was known as Smyrna Army Airfield. The West Virginia Air National Guard is the air force militia of the State of West Virginia, United States of America. It is, along with the West Virginia Army National Guard, an element of the West Virginia National Guard. The 130th Airlift Wing is a unit of the West Virginia Air National Guard, stationed at McLaughlin Air National Guard Base, Charleston, West Virginia. If activated to federal service, the Wing is gained by the United States Air Force Air Mobility Command. The 133rd Airlift Wing is a unit of the Minnesota Air National Guard, stationed at Minneapolis–Saint Paul Joint Air Reserve Station, Minnesota. If activated to federal service, the Wing is gained by the United States Air Force Air Mobility Command. The Byrd Station is a former research station established by the United States during the International Geophysical Year by U.S. Navy Seabees during Operation Deep Freeze II in West Antarctica. The 139th Airlift Squadron is a unit of the New York Air National Guard 109th Airlift Wing Stationed at Stratton Air National Guard Base, Schenectady, New York. The 139th is equipped with the specialized ski-equipped LC-130H Hercules for polar operations.